CIO Chassis In One incorporates the best features of many different coatings to be a superb all round product. CIO is semi self etching, so has high adhesion to many different substrates such as steel, keyed aluminium, and corrosion. Its a black satin finish so gives a great OEM look, stabilises corrosion, is a primer so can be top coated, and is also a top coat so doesn't have to be over coated. Add to this it is a zero rust creep product, can be applied by various means, is very tough with Impregnated Toughened glass flake and is very fast cure it is one of our most popular products. Compatible with some synthetics once fully cured. Good protection of many different metals such as aluminium, and and steel. Production Environment/ Time limited application. Fast cure coating so in windy/ high temperature scenarios it can be impossible to use. Shake the can for two full minutes with the agitating ball active. Apply in cross coats at 90 degree angles allowing the coating to cure between coats. Coating will take 5>15 minutes to tack off, and around 1/2 a day to fully harden. can be over coated with CIO as soon as its touch dry, leave longer if doing heavier coats with a brush or similar. Following application if the entire aerosol is not used invert the can fully and depress the nozzle for 2>3 seconds to clear the actuator so it can be used again later. Consider an aerosol unblocker kit. CIO aerosols can block within a minute if you do not clear the nozzle after each use. Be sure to apply enough product. "Blacking" is the process of applying enough product to cover an item with colour, but not enough to protect it. Failure typically occurs within 6 months, and will result in spot rust and sub surface corrosion occurring. You are aiming for Sufficient DFT (Dry Film Thickness) to cover the piece properly. CIO has extremely good opacity, and will black a substrate with only around 30% of the actual amount of product needed for a typical application. ALWAYS a minimum of two coats. Heavy corrosion up to 5 coats with the aerosol. If unsure contact us. Stir and agitate the product thoroughly prior to use using an agitator. After you have applied your first coat, allow it to cure for 30> 60 minutes typically. Apply your second coat using a large softer brush so as not to damage the first coat. The coating will tend to self-level and leave you a good finish. Coating will take 18>36 hours depending on conditions to fully harden. The solvents in CIO can attack cheap rollers. Purchase rollers that are solvent compatible. Ensure coating is hard dry prior to use. CIO Can be sprayed by various means. 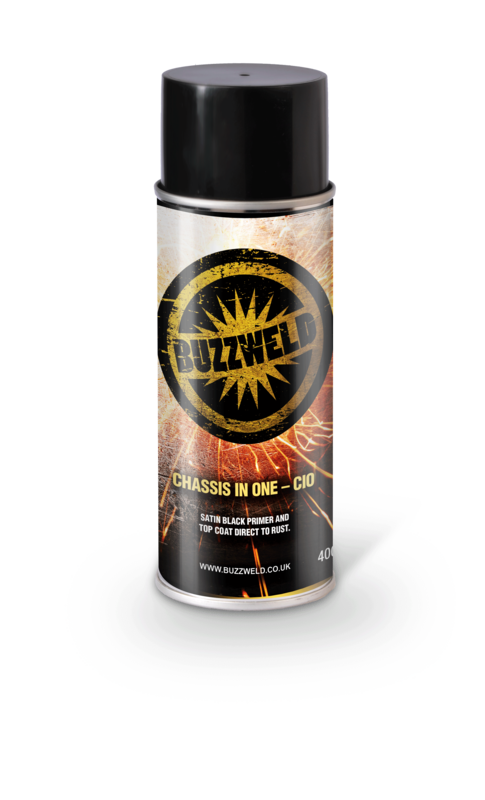 Buzzweld 1.8MM Suction Feed gun. Thin CIO using CIO Thinners up to 15%. Using a 400 Micron strainer load the gun with product, and set the pressure between 60- and 70 psi. Thin the MINIMUM so you can use less coats and save time. CIO is unlikely to react with most products used correctly. Sensible guidelines to reduce the risk of product reactions are as follows. Ensure that any existing product to be top coated with CIO is FULLY cured prior to top coating. There is a big difference between hard and fully cured. For example 2 pack acrylics can be hard same day, but take up to two weeks to fully harden so that they can be machine polished. Tough, touch dry coating, with good resistance to abrasion, and a high build. Use thinners to thin the product that are not CIO specific thinners. CIO is a specific hybrid coating, and using the incorrect thinners can cause premature failure, delamination, and porosity. 2500ML for a chassis and axles up to 110 size if not pitted/ rough profile. 5000ML for a chassis and axles up to 110 size if not pitted/ rough profile.